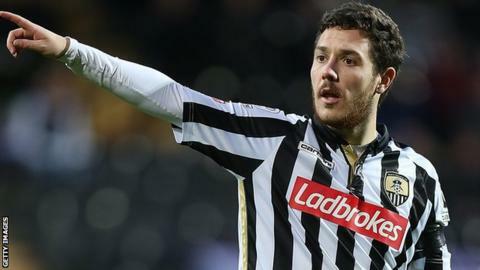 Liam Noble scored a 96th-minute winner against Newport in a seven-goal thriller that saw Notts County fight back from an early two-goal deficit. Mark Byrne and Alex Rodman both struck inside 10 minutes for Newport. Noble pounced on a defensive mix-up to pull a goal back before his free-kick off the post was steered home by Izale McLeod to make it 2-2. McLeod then nodded Notts ahead and Scott Boden levelled from close range, only for Noble to win it for Notts. Noble's calm close-range strike means Notts move up to 14th in the League Two table, five points off the play-off places and nine points clear of Newport. "It's never boring, but we must be realistic because based on the first 20 minutes we could be 3-0 down. "But Liam Noble scored a fantastic goal and that brings us back in the game. "At that moment we are lifted because we were mentally broken." "To score three goals away from home you expect to get something out of the game and when you were 2-0 up as well. "I thought at the start of the game we were outstanding and the game should have been over, we had two really chances to kill the game off. "We've worked our socks off again and it would have been nice to have kept our run." Match ends, Notts County 4, Newport County 3. Second Half ends, Notts County 4, Newport County 3. Liam Noble (Notts County) is shown the yellow card for excessive celebration. Goal! Notts County 4, Newport County 3. Liam Noble (Notts County) right footed shot from the centre of the box to the bottom left corner. Substitution, Notts County. Ronan Murray replaces Graham Burke. Oliver McBurnie (Newport County) wins a free kick in the defensive half. Attempt saved. Adam Campbell (Notts County) right footed shot from the right side of the box is saved in the centre of the goal. Goal! Notts County 3, Newport County 3. Scott Boden (Newport County) right footed shot from very close range to the centre of the goal following a corner. Corner, Newport County. Conceded by Alan Sheehan. Attempt blocked. Scott Boden (Newport County) right footed shot from the centre of the box is blocked. Foul by Oliver McBurnie (Newport County). Goal! Notts County 3, Newport County 2. Izale McLeod (Notts County) header from the left side of the six yard box to the bottom left corner. Substitution, Newport County. Scott Boden replaces Lenell John-Lewis. Attempt saved. Jon Stead (Notts County) header from the centre of the box is saved in the centre of the goal. Corner, Notts County. Conceded by Matt Partridge. Attempt blocked. Adam Campbell (Notts County) left footed shot from outside the box is blocked. Attempt blocked. Alan Sheehan (Notts County) left footed shot from outside the box is blocked. Oliver McBurnie (Newport County) is shown the yellow card. Substitution, Notts County. Mawouna Kodjo Amevor replaces Elliott Hewitt because of an injury. Attempt missed. Jon Stead (Notts County) right footed shot from the centre of the box is just a bit too high. Attempt missed. Jon Stead (Notts County) right footed shot from outside the box is close, but misses to the right. Corner, Notts County. Conceded by Mark Byrne. Substitution, Notts County. Robert Milsom replaces Civard Sprockel. Substitution, Newport County. Danny Holmes replaces Jazzi Barnum-Bobb.